Canine lymphomas are a diverse group of cancers, and are among the most common cancers diagnosed in dogs. They collectively represent approximately 7-14% of all cancers diagnosed in dogs. There are over 30 described types of canine lymphoma, and these cancers vary tremendously in their behavior. Some progress rapidly and are acutely life-threatening without treatment, while others progress very slowly and are managed as chronic, indolent diseases. Lymphomas may affect any organ in the body, but most commonly originate in lymph nodes, before spreading to other organs such as the spleen, liver, and bone marrow. Canine lymphomas are similar in many ways to the non-Hodgkin's lymphomas (NHL) which occur in humans. Canine lymphomas and NHL are nearly indistinguishable when examined microscopically, and both tumor types exhibit similar responses to chemotherapy. In 2010, NHL was diagnosed in approximately 65,000 people in the United States, and claimed approximately 20,000 lives, making it the 7th-most common cancer overall, and the 6th-most common cause of cancer-related death. It is one of the few human cancers for which the frequency of newly diagnosed cases is still on the rise. It is our hope that research in canine lymphomas conducted by the Purdue Comparative Oncology Program will discover new ways of treating NHL in both dogs and humans. Our goal is to improve the outlook for dogs and humans affected with this all-too-common cancer. The term “lymphoma” describes a diverse group of cancers in dogs that are derived from white blood cells called lymphocytes. Lymphocytes normally function as part of the immune system to protect the body from infection. Although lymphoma can affect virtually any organ in the body, it most commonly arises in organs that function as part of the immune system such as the lymph nodes, spleen, and bone marrow. By far the most common type of lymphoma in the dog is multicentric lymphoma, in which the cancer first becomes apparent in lymph nodes. The photo to the right shows a dog with multicentric lymphoma. Note the swollen mandibular lymph node (white arrow) under the jaw. Other common lymphomas in dogs include cutaneous lymphoma (lymphoma of the skin), alimentary or gastrointestinal lymphoma (lymphoma of the stomach and/or intestines) and mediastinal lymphoma (lymphoma involving organs within the chest, such as lymph nodes or the thymus gland). What causes lymphoma in dogs? Unfortunately, the cause of lymphoma in dogs is not known. Although several possible causes such as viruses, bacteria, chemical exposure, and physical factors such as strong magnetic fields have been investigated, the cause of this cancer remains obscure. Suppression of the immune system is a known risk factor for the development of lymphoma in humans. Evidence for this includes increased rates of lymphoma in humans infected with the HIV virus or are on immune-suppressing drugs following organ transplantation surgery. However, the link between immune suppression and lymphoma in dogs is not clearly established. What are the most common symptoms of canine lymphoma? 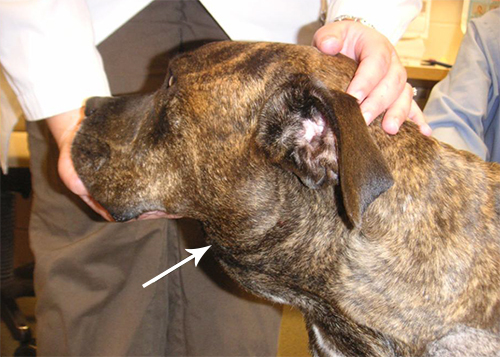 The most common initial symptom of multicentric lymphoma in dogs is firm, enlarged, non-painful lymph nodes. A lymph node affected by lymphoma will feel like a hard, rubbery lump under your dog’s skin. The most easily located lymph nodes on a dog’s body are the mandibular lymph nodes (under the jaw) and the popliteal lymph nodes (behind the knee). Other common symptoms include loss of appetite, lethargy, weight loss, swelling of the face or legs (edema), and occasionally increased thirst and urination. The photo on the left shows a dog with edema of the left rear leg. This is caused when a swollen lymph node blocks the normal drainage of fluid from the leg. Cutaneous lymphoma tends to appear first as dry, flaky, red, and itchy patches of skin anywhere on the body. As the disease progresses, the skin becomes moist, ulcerated, very red, and thickened. Masses in the skin can also occur with cutaneous lymphoma. Cutaneous lymphoma may progress slowly and often has been treated for several months as an infection or allergy before a diagnosis of lymphoma is made. Cutaneous lymphoma may also appear in the mouth, often affecting the gums, lips, and the roof of the mouth. Cutaneous lymphoma in the mouth is often mistaken for periodontal disease or gingivitis in its early stages. The photo on the left shows cutaneous lymphoma in the mouth of a dog. Note the very red gums and the ulceration on the roof of the mouth. Dogs with gastrointestinal lymphoma usually have symptoms such as vomiting, watery diarrhea, and weight loss. The diarrhea is often very dark in color and foulsmelling. Dogs with mediastinal lymphoma typically have difficulty breathing. This may be due to the presence of a large mass within the chest or due to the accumulation of fluid within the chest (pleural effusion). Affected dogs may also show swelling of the face or front legs as well as increased thirst and urination. How is canine lymphoma diagnosed? The best way to diagnose lymphoma is to perform a biopsy. A biopsy is a minor surgical procedure to remove a piece of lymph node or other organ affected by cancer. The most common methods for lymph node biopsy are Tru-cut needle biopsy, incisional wedge biopsy, or removal of an entire lymph node (excisional biopsy). The larger the biopsy sample, the better the chance for an accurate diagnosis of lymphoma. We routine perform biopsy procedures to diagnose canine lymphoma at the Purdue University Veterinary Teaching Hospital (PUVTH). Dogs are placed under heavy sedation or general anesthesia to perform a biopsy. Although discomfort associated with this procedure is typically minimal, we often prescribe oral pain medication afterwards just to be sure your dog is comfortable following the biopsy. Are any other diagnostic tests required for dogs with lymphoma? In addition to biopsy, we recommend several staging tests for dogs with lymphoma. The purpose of the staging tests is to determine how far the lymphoma has spread throughout your dog’s body. In general, the more places the lymphoma has spread to, the poorer the dog’s prognosis. However, dogs with very advanced lymphoma can still be treated and experience cancer remission (see more on treatment below). Staging tests also help us assess whether your dog has any other conditions that may affect treatment decisions or overall prognosis. The staging tests we typically recommend include blood tests, a urinalysis, x-rays of the chest and abdomen, an abdominal sonogram, and a bone marrow aspirate. Organs that appear abnormal on sonogram can be sampled with a small needle (fine needle aspirate) to confirm the presence of lymphoma. How is canine lymphoma treated? The most effective therapy for most types of canine lymphoma is chemotherapy. In some cases, surgery or radiation therapy may also be recommended. There are numerous chemotherapy treatment protocols for dogs with multicentric lymphoma. As discussed below, most dogs with lymphoma experience remission of their cancer following treatment, and side effects are usually not severe. Currently, the protocols that achieve the highest rates of remission and longest overall survival times involve combinations of drugs given over several weeks to months. The protocol we use as a “gold standard” for the treatment of canine multicentric lymphoma is a 25-week protocol called UW-25. It is based on a protocol called CHOP that is commonly used to treat lymphoma in humans. The UW-25 protocol may not be appropriate for all dogs with lymphoma. Different types of lymphoma may be treated with different chemotherapy drugs. For instance, the most effective drug for cutaneous lymphoma is thought to be lomustine (CCNU). The veterinary oncologists and oncology residents at the PUVTH will help you decide on a chemotherapy treatment protocol that is appropriate for your dog. "Remission" means a regression of your dog’s cancer. Remission may be partial, meaning the overall cancer burden has been reduced by at least 50%, or it may be complete, meaning the cancer has become undetectable to any readily available screening test. In general, 70-90% of dogs with multicentric lymphoma treated with UW-25 experience complete or partial remission of their lymphoma, with most dogs experiencing complete remission. How is chemotherapy given at Purdue? Most chemotherapy drugs are given by intravenous (IV) injection, although a few are given by mouth as a tablet or capsule. Typically, an IV catheter will be placed in one of your dog’s veins to allow us to administer chemotherapy safely. A small patch of hair will be shaved over your dog’s leg where the catheter is placed. Chemotherapy appointments with the PUVTH oncology service are on weekdays, Monday - Thursday. Patients are usually dropped off at 9:00 AM and are ready to go home by 12:00-1:00 PM. Most dogs tolerate chemotherapy well, much better than humans typically do. Although some dogs do get sick from chemotherapy, serious side effects are uncommon. In general, fewer than 5% of dogs treated for lymphoma using chemotherapy will experience side effects that need to be managed in a hospital setting. The most common side effects include loss of appetite, decreased activity level, and mild vomiting or diarrhea that persists for one or two days. If serious or unacceptable side effects do occur, it is important that you talk to one of our oncology doctors or staff about this. We can recommend symptomatic treatment to lessen the side effects of chemotherapy. In addition we may recommend reducing the dose of chemotherapy the next time it is to be given. Unlike people, dogs usually do not lose their hair when treated with chemotherapy. The exceptions to this rule are poodles, Old English sheepdogs, and some terriers – these breeds may lose their hair while receiving chemotherapy. Hair growth should resume once chemotherapy is discontinued. Will chemotherapy cure my dog’s lymphoma? In rare instances, dogs are apparently cured of their lymphoma by chemotherapy. Unfortunately, most dogs with lymphoma will have relapse of their cancer at some point. A second remission can be achieved in a large number of dogs, but it is usually of shorter duration than the first remission. This is because the lymphoma cells become more resistant to the effects of chemotherapy as time goes on. Eventually, most lymphomas develop resistance to all chemotherapy drugs, and dogs with lymphoma die or are euthanized when the cancer can no longer be controlled with chemotherapy. What is the prognosis for dogs with lymphoma? Your dog’s prognosis is determined by what type of lymphoma he or she has and what type of chemotherapy is used to treat the lymphoma. The median length of survival of dogs with multicentric lymphoma treated with UW-25 chemotherapy is between 9-13 months. (The term “median” implies that 50% of dogs will survive beyond this time point and 50% of treated dogs will die before this time point.) Various other factors, such the type of lymphoma your dog has or its stage of disease, may affect your dog’s overall prognosis. The oncologists and oncology residents at the PUVTH will discuss your dog’s prognosis in detail with you before any treatment decisions are made. Are there any studies at Purdue involving canine lymphoma? Yes! We are currently conducting multiple clinical trials for dogs with lymphoma at Purdue. Varying degrees of financial support are available to owners who agree to allow their dogs participate in these clinical trials. To determine whether your dog may qualify for a clinical trial, please ask your dog's primary care veterinarian to call 765-494-1107 and ask to speak with a member of our Canine Lymphoma clinical trials team, or you may contact our Canine Lymphoma Clinical Trials Coordinator, Ms.Sarah Lahrman at 765-496-6289.